With more than 35 dancing groups participating, and a program of more than eight hours, the annual Greek-Serbian Orthodox and Cultural Friendship Day was celebrated last Sunday in Rooty Hill, Sydney. Serbian and Greek dancing schools were joined by other Orthodox communities to give unique colour and a wide array of traditional sounds in what was the biggest and most visited friendship day in its 20 year long history. The day started with the Holy Liturgy in the packed St Stefan Serbian Orthodox Church which was concelebrated by the Metropolitan Theodosios of Sebaste, of the Antiochian Orthodox Church, alongside the Bishop of the Serbian Orthodox Church of Australia, His Grace Irinej. Present at the Holy Liturgy were the newly arrived Consul General of Greece in Sydney Dr Stavros Kirimis, the Consul General of Serbia Mr Branko Radosevic, the Consul of Romania Ms Roxanna Mocanu, alongside dignitaries from both the Greek and Serbian communities of Sydney. On the initiative of the Serbian Orthodox Church of St Stefan, the event has been taking place every September since 1994, in order for the local Serbian community to express its appreciation towards the invaluable assistance of the Greek people during the war and the American-NATO led bombings of the country. The next rendezvous for the 21st anniversary was booked for mid to late September 2014 in the same hall. 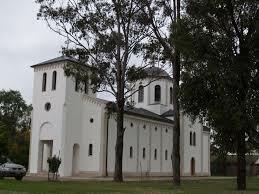 In 1994, after the years when the invaluable help and support of Greeks from Greece, Cyprus and diaspora was outpouring for Serbian people in their war-torn countries of former Yugoslavia, one small Serbian Orthodox parish community in Western Sydney wanted to show the appreciation for everything Greek people did for them. As the co-organiser on behalf of the Greek Community and MC of the event Dimitrios Kametopoulos told Neos Kosmos, the event was an initiative of Serbian Orthodox church and parish community “St Archdeacon Stephan”, at Rooty Hill. Due to the tireless efforts of this Serbian parish and their Greek counterparts, the Greek-Serbian friendship day has every year seen thousands of people pass through its doors. “The Serbian church and the general community wanted to show their appreciation to Greeks for their invaluable help during the Yugoslav wars, and particularly the Serbs in Bosnia wanted to show the appreciation for the orphan kids who were hosted by families from Northern Greece – Thessaloniki, Florina, Kastoria… Greeks supported Serbian people on moral, material and psychological level during the 1990s war, as well as during the NATO bombing of Serbia,” Kametopoulos says. All that appreciation was enhanced with the long history of friendship of Greeks and Serbs through common threads they share – Orthodoxy and tradition. “Furthermore, the Greek businesses in Serbia happen to be amongst the largest entrepreneurs today, while there are thousands of Serbs who choose Greece as their holiday destination from year to year,” he adds. Multiple connections of the two nations have culminated in a wonderful annual event, that this Sunday reaches its 20th anniversary. For this special occasion, six other Sydney Orthodox communities have been invited to take part in the Friendship Day. “Every year in September, the Sydney Serbians and the Sydney Greek community get together, and celebrate. For the first time this year other Orthodox communities have been invited to participate and co-celebrate with us – Russian and Ukrainian dancing groups will took it to the stage, as well as Bulgarian, Romanian, Assyrian, Armenian and Palestinian Orthodox communities’ dancing groups,” Kametopoulos says. The aim of this 20 years old event that seems most obvious – bringing together the Orthodox youth in Australia – could be an aim down the track. But, at the moment, as coordinator Dimitrios Kametopoulos says, it is, above all, bringing the communities together and appreciating their common threads. This year’s program will start with Orthodox liturgy, con-celebrated between the Serbian and the Greek priest. The liturgy will be followed by the cultural program, with kick-off at 12.30 pm and six hours of music and dancing. “Due to its multi-communal and multilingual character that the event puts on this year, as it opens up to other communities, couple of thousands of people are expected to make their way to Serbian Orthodox Church in Rooty Hill,” Kametopoulos says.